The average person will move over 11 times in their life, and the difference between a good move and a bad move comes down to two things: Is it raining and did grandma’s china arrive intact. While we can’t control the weather, with the proper packing materials, you can guarantee the china makes it in one piece. Whether you are moving across the city or across the country, we are here for our heroes! Sign up and see how Homes for Heroes can save you money on your next buy, sell, or refinance! There are many packing materials available to you, but keeping it simple is the best and surprisingly least expensive way to go. You want a large package of 24” x 36” packing paper. Ten pounds of paper may be enough for a small collection of china, but 20 pounds would be needed for a complete 12 place setting with serving dishes. Packing paper is a heavy-duty newspaper without print, and it provides the best support and protection for breakables. Don’t skimp on this item. You want a good quality paper, and you want a lot of it. For smaller pieces, buy tissue paper at your local store with “dollar” in the title. That seems to be the most inexpensive source of tissue paper. Purchase brand new medium size boxes that are all one uniform square size. An adequately packed box, stacked with identically sized square boxes, is the most secure and resilient packing method. Buy a sufficient number of glass pack kits. These are a grid of cardboard with sections for glasses and stemware. Use black and red permanent markers to mark the boxes. You want to use the red to mark FRAGILE CHINA in large block letters on the front and top of every box. 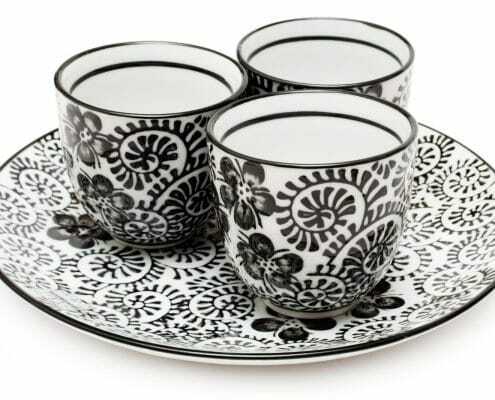 Use the black to label the contents and name of china pattern, if you have more than one. Packing tape completes the list of materials. The basic technique is to pack the boxes in such a way that when you shake the sealed box up, down and sideways, no two pieces of china strike each other, and you hear absolutely no shifting. The box should be packed as tightly with paper as possible, keeping the square shape of the containers (no bulging sides or tops). Start every box with a one to two-inch layer of crumpled paper, placing the heaviest items in the bottom. 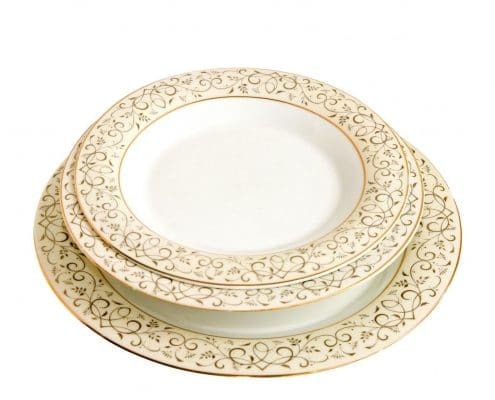 Pack same sized china pieces in bundles. Don’t pack any box so dense that you can’t comfortably lift and carry it securely. Stack these boxes together and move them when you are fresh and rested. Only adults move boxes marked FRAGILE CHINA. Let the kids take the boxes of less fragile items. Get all the boxes moved before you start getting tired. Start with plates as they are the easiest type to bundle. Place the wrapping paper on a table with a corner pointing at you. Wrap the plate once diagonally, then tuck the left side of the paper on top of the plate, then the right side of the paper. Wrap diagonally once more, then tuck left side, then right. Continue until you finish the piece of packing paper. Wrap four plates individually. Stack them together in the same direction and wrap the bundle of four plates together. Continue until you have bundled all plates. Use this method with dinner plates, salad plates, and saucers. Pack all the bundled dishes edge side down, as impact to the center of the plates is the most dangerous. Wrap bowls similarly, but in bundles of two or three. Bowls with handles are wrapped separately, one at a time. Verify that the handles are sufficiently cushioned, wrapping each bowl separately with two or three wraps of paper, depending on the size of handles. Again, pack these bundles with the edge (not a handle side) down. Wrap tea cups and mugs from the corner with left and right side tucking covering the handle. Bundle them two at a time with the body of one supporting the handle of the other. These bundles can be stacked or laid on their side. Take extra care with serving pieces by using a second or third paper wrap. With large platters, stagger two pieces of paper, so you have two corners pointing towards you about six inches apart. Wrap diagonally twice then tuck the left side and the right side. Continue to the end of the paper and repeat. When you are packing any piece with a lid, wrap the lid first, keeping track of the top handle. Wrap the serving piece and then bundle with the handle upside down inside the serving piece. Having the handle facing the empty cavity of the serving piece ensures that other bundles will not strike it directly. With large and expensive pieces like Teapots, Coffee Pots, and Soup Tureens, take the extra precaution of wrapping them alone. 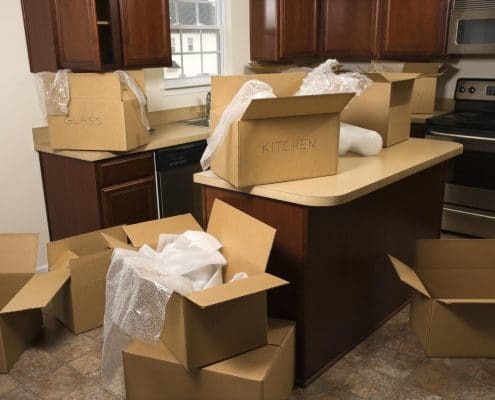 When items break, it is usually due to striking other items in the box, so packing them separately with lots of crumpled packing paper is the safest way to transport them. Wrap each glass individually, placing them in the gridded glass pack kits. Place layers of cardboard in between glass pack kits. With stemware, you want to take a piece of packing paper and fold it to the height of the stem. Wrap the folded piece of paper around the stem and secure with tape. Then wrap the glass diagonally and place in the glass pack grid. Some china has pieces with incredibly fragile ceramic leaves and flower petals, et cetera. In these cases, you want to cushion those delicate parts with several layers of tissue paper before you wrap in packing paper. Arrange the tissue paper, so it cups the areas in protected airspace, allowing the packing paper to support the tissue paper structure. You may want to find cardboard boxes to wrap these incredibly fragile items and then place these smaller boxes in the packing box. 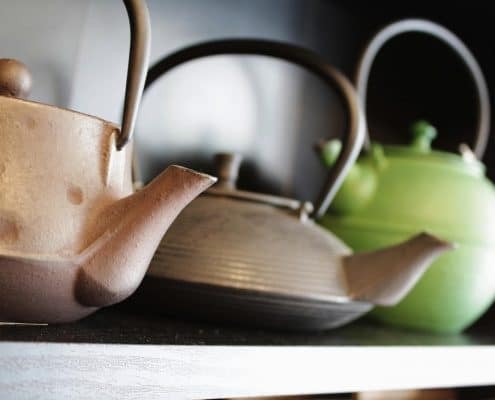 Using these materials and methods, you should be able to successfully pack, store and move your valuable china knowing you’ve offered it the best protection to enjoy it long into the future.